The Geospatial Forum brings together researchers, educators, practitioners, and students of the geospatial sciences in an exciting series of lively presentations and discussions of frontiers in geospatial analytics for solutions to environmental and societal challenges. Come exchange ideas with each other and our distinguished guest speakers as they share their latest research, experiences, and applications in geospatial analytics. Everyone is welcome! 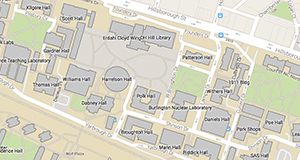 Members of the public can find parking information through the NC State Transportation Office; the nearest hourly pay lots to Jordan Hall are located at the Weisiger-Brown Athletic Facility and Avent Ferry. Many free Wolfline bus routes provide service to Jordan Hall at the Morill Drive/Faucette Drive stop, including Routes 1, 5, 7, 8 and 9; Routes 1, 8, 9 and 11 also stop a short walk northwest of Jordan Hall at the Dan Allen Drive/Hodges Building stop. Live bus information is available at ncsu.transloc.com. The Forum is a Wolfpack Certified Sustainable event. As part of our sustainability efforts, we encourage attendees to please bring your own cup, mug, or thermos for coffee and tea. Would you like to add the Geospatial Forum to your Google Calendar? Follow this link to the public calendar and click the “+GoogleCalendar” button in the bottom right corner. The Geospatial Forum calendar will then appear under “Other Calendars” in your account. Geospatial Forums are recorded and generally available on YouTube within 48 hours. Recordings of presentations dating back to 2014 are also available on iTunes U. The center hosts the Forum on most Thursdays during Fall and Spring semesters (note schedule below) at 3:30-4:30pm in 5103 Jordan Hall, NC State Central Campus. The event is free and open to the public. Light refreshments and coffee are served at 3:00 pm in the 5th Floor lobby. Check the program below for topics that may interest you. We hope to see you at a future Forum!